Developers love meet-ups. Almost every programming language has its own local meet-up. Almost. There wasn’t a CSS-specific meet-up in Singapore at the time, and usually talks related to CSS latched onto other meet-ups like Talk.JS or Front End Developers Singapore. 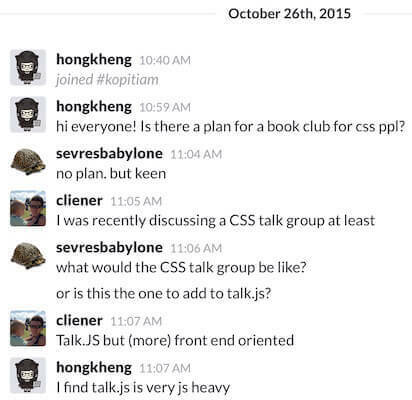 Talk.CSS came into being on October 26, 2015. It all started from a random conversation in our local digital watering hole, the KopiJS slack channel. The idea of starting a CSS meet-up seemed to take quite well and by 4pm we already had a logo, a GitHub organisation, a Twitter account and the venue for our inaugural meet-up. We can’t talk about tech meet-ups in Singapore without mentioning webuild.sg, THE hub for all things tech on this little red dot. If you’re interested to attend any other tech meet-ups, definitely check it out. For data buffs, there is https://webuildsg.github.io/data/, which has information on tech meet-ups in Singapore dating back to December 2014. As of August 2018, webuild.sg has merged into Engineers.SG, so please refer to https://engineers.sg/events for the list of upcoming open developer, design and maker events in Singapore. Also, a huge kudos to Engineers.SG, which records videos of almost every single tech meet-up in Singapore. Credit to Michael Cheng and his army of videographers for making this possible.